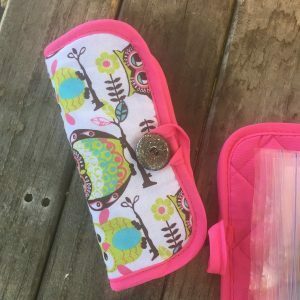 April 21, 2018 0 comments on "DIY Travel Sized Sewing Kit"
I am always looking for fun easy homemade gift ideas. 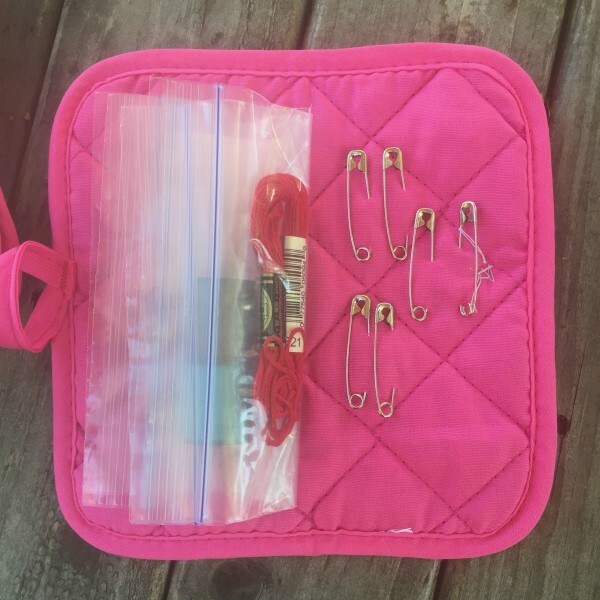 I recently ran across this idea for making DIY travel sized sewing kit from pot holders. They were so cute I just had to make one! 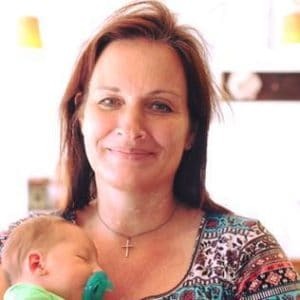 These sewing kits are a great holiday gift idea and they are also perfect for packing in shoe boxes for Operation Christmas Child. These sewing kits are really easy to make. I purchased a lot of the items from Amazon, but you could also get them at your local craft store. You can use any pot holders you like, but I found these adorable owl pot holders on Amazon in a package of 10 for $10 so I couldn’t pass them up. My church’s women’s group put together 10 of these sewing kits to put in shoe boxes for Operation Christmas Child, but you could just as easily put together 10 to give away to friends and family members as thoughtful holiday gifts. To assemble the kit, you are just going to fold the pot holder in half, with the loop on the pot holder on one of the sides. Use a needle and thread to sew a large button on the other side of the pot holder so that when you fold the pot holder in half the loop will easily slip over the button to hold the sewing kit in place. Next you will need some snack sized ziploc bags . I used four bags inside of my sewing kits. 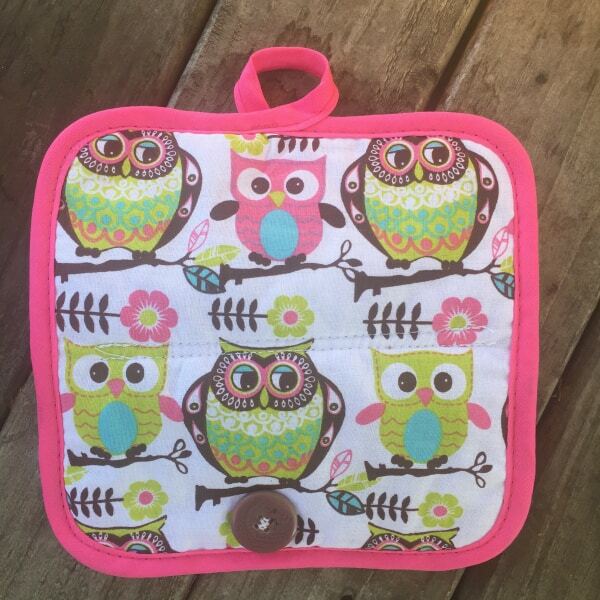 Open up the pot holder, and place the bottom of a snack bag along the center on the pot holder. If the ziploc end of the bag is sticking out past the edge of the pot holder, then cut the bottom off of the ziploc bag. Keep trimming it until it fits entirely inside the pot holder (see photo). Place four ziploc bags in the center of the pot holder, having two bags facing each side of the pot holder. Alternate bags so that one is facing to one side, the next to the other side, etc. All of the bottoms should meet at the center of the pot holder, slightly overlapping each other. Pin the ziploc bags in place. You will need a sewing machine to sew the bags to the pot holder. I sewed two lines of stitching down the center of the pot holder so that the ziploc bags would not easily rip off of the pot holder. Now you are ready to pack your sewing kit. There are lots of different items you can place in the sewing kits. You can pin safety pins to the sides of the pot holders. I placed small spools of thread in mine. From Amazon you can order a set of 12 small spools of thread for less than $10. In addition to the sewing thread, you can also place embroidery thread in the kit. I found a neat little trick for putting the needles in the kit. Just cut a small piece of felt and place the needles in the felt before placing in the kit. You can put extra buttons in the kit, a measuring tape, small scissors, or anything else you can think of that would fit in the kit. That’s it! You can find some of these items at the Dollar Store too. I didn’t take a good look at what they had there, but I know that is definitely a great place to get the pot holders. I really enjoyed making these and can’t wait to put them in our shoe boxes or give them away as gifts this year!